Applying for new jobs, managing career progression, and achieving their goals. Although workplace discrimination may still exist, things are getting better. All the time, employers are updating and developing their workplace policies and practices to ensure that people living with HIV get a fair deal. 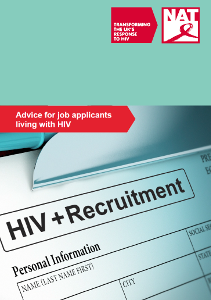 Recent updates to disability discrimination law in the Equality Act 2010 offer greater protection to people living with HIV from discrimination in employment. Under the Equality Act, HIV is defined as a disability from the point of diagnosis. So whether or not you consider yourself disabled, you are protected against disability discrimination at work.